Groove recently announced a new collaboration between Tokidoki and Pullip via their blog. 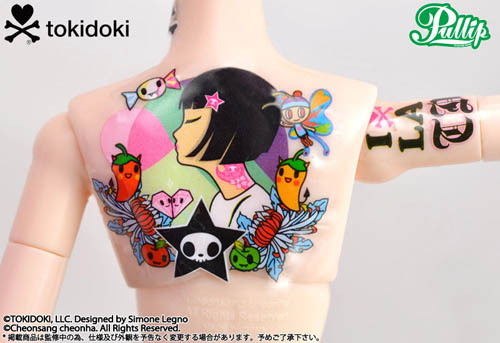 For those of you don’t know, Tokidoki is a lifestyle brand that debuted in 2005 and was created by Italian artist Simone Legno. 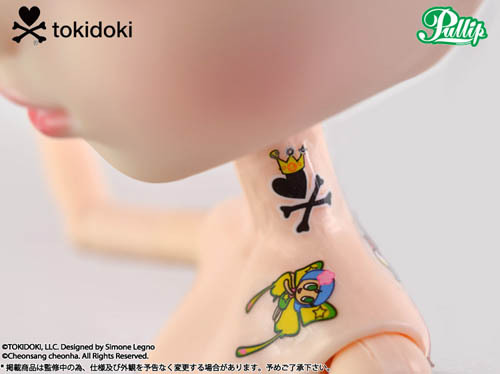 A wide variety of Tokidoki items ranging from clothing to vinyl figures to purses and skateboards have been released and they have even collaborated with such companies as Marvel as well as collaborating with Mattel to release a Limited Edition Barbie. Lunarosa appears to be a recolored version of the original Tokidoki x Pullip release Luna. Luna was pre-released at Doll Carnival 2012 before being released for general sale later in the spring of 2013. Luna was wildly popular so it isn’t that surprising that Groove would do a second collaboration with Tokidoki. Lunarosa has a MSRP of 16000 yen and will be available via Grooveshop starting on January 22nd and set for release on January 31st. Kind of short notice about this release which is particularly surprising since we still don’t even know what February’s releases actually are yet and normally they are announced a few months ahead of time. She is already popping up for preorder at such places as HLJ and Amiami so at this point I’m personally going to assume that Pullipstyle will more than likely be able to stock her and I’ll just wait on them. Lunarosa has the same stock as the original Luna except now it’s mostly in pink (rosa does mean pink in Spanish so she is literally a pink Luna). Her hat features the Tokidoki character Ciao Ciao from ‘Til Death Do Us Part, her skirt features more art from ‘Til Death Do Us Part, her shirt features Sandy from the Cactus Friends series and she comes with a small plush of the character Donutella from Donutella and her Sweet Friends series. She comes with an alternate outfit consisting of an asymmetrical shirt with a Tokidoki print and a pair of short shorts. The print on this shirt is the same print as on her messenger bag. Lunarosa comes with tattoos, Luna also came with tattoos but it is of note that unlike the rare previous releases that had tattoos that came on the doll Luna’s tattoos did not come already on the doll. The tattoos came on a sticker sheet so there were placement options and if you are one of those people who like to obitsu or otherwise rebody your dolls you could just put the tattoos on your body of choice (or you could steal a few of the tattoos for another doll if you prefer like I did with one of my Papins with some of Luna’s). It’s not known at this time if Lunarosa will have her tattoos on a sticker sheet like Luna did but there is precedence for it. Personally I think the fairy tattoo is my favorite. Verdict: I’m cautiously optimistic about Lunarosa. When Luna was announced I couldn’t have been happier, I was so in love with her as she was a mix of two of my favorite brands that I actually bought two of her. Unfortunately Luna had some quality control issues so I ended up slightly disappointed with her, she was still a beautiful doll but the quality of her wig and some of her accessories were a bit iffy ^^;. My experience won’t put me off though, I still intend on buying Lunarosa as she is a gorgeous doll. This entry was posted in Doll, Pullip and tagged luna, lunarosa, Pullip, tokidoki. Bookmark the permalink.